Maintaining a healthy, green lawn requires hard work and patience. For many people, particularly those who live in warm and dry climates, the effort is too much. Others are concerned about wasting water on natural lawns or using chemicals to keep the grass green. Artificial turf grass offers a solution to many of these problems. However, there are significant disadvantages to artificial turf as well, and homeowners should consider both the pros and cons before making a decision about converting their lawn to artificial turf. Artificial turf grass maintains its green, healthy appearance despite weather conditions. The sun doesn't fade or dry it, and it won't lose its color from wear and tear. The look of the artificial turf grass can even be customized to a shade that you prefer or a blend of several shades so it has a more natural appearance. Lawns made of artificial turf grass require little to no maintenance. They don't need fertilizer to maintain their healthy, attractive appearance, and they never need to be mowed. In areas of the country where water supplies are limited, artificial turf grass has gained in popularity because it does not require any watering. Homeowners with artificial turf grass lawns generally save on water bills as well as conserve water for their community. Artificial turf grass does not require any pesticides, so there are no health risks associated with those chemicals. In addition, artificial turf does not attract insects, snakes, lizards, rodents or other unwanted pests to your lawn. The initial cost of installing an artificial turf grass lawn can be quite expensive. In many cases, the lawn may wind up paying for itself in several years with the money saved on maintenance costs, but for individuals who are on tight budgets, it may be difficult to find the money for the initial installation. Because it is not real grass, artificial turf grass does not return oxygen to the air. For individuals who choose artificial turf grass due to environmental concerns, this may defeat the purpose. Artificial turf grass is made of plastic and other synthetic materials, and readily absorbs heat. On particularly hot or sunny days, the artificial turf may become extremely uncomfortable to play, run or walk on. 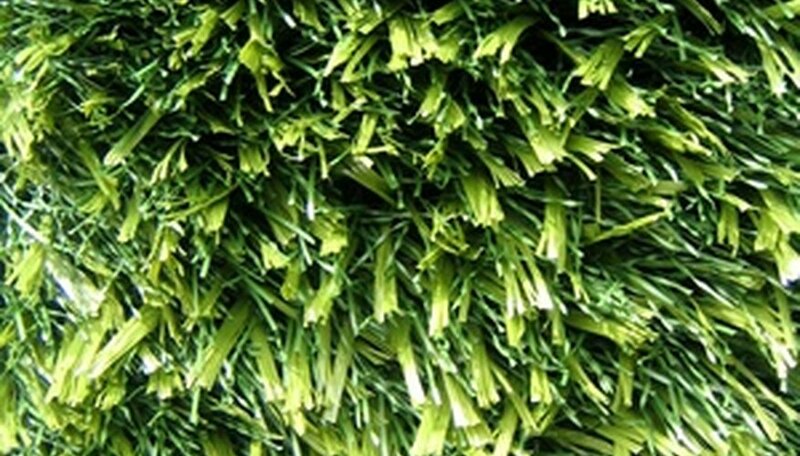 Some artificial turf grasses contain lead to help maintain their green color. Even small amounts of lead can be harmful to people. Lead is particularly dangerous for young children who are still developing physically, so artificial grass is not a good choice for families. In addition to lead, artificial turf grass may contain other toxic materials, such as arsenic, selenium, chromium and cadmium. After heavy rainstorms, runoff from an artificial lawn which carries these toxic substances could bleed into the neighborhood’s ground and drinking water, posing a health risk. Sunset: Should you fake the lawn? Health News Digest: Artificial Turf for Residential Lawns? When to Put Gypsum on Your Lawn for Dog Spots? What Are the Dangers of Lawn Chemicals?